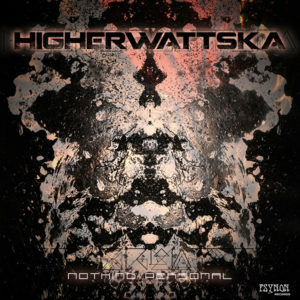 Psynon Records are thrilled to bring you Nothing Personal, the blasting solo debut of South African duo HigherWattska, a collaboration between Highstyle and Killawatt. Friends for many years, this pair fully compliments each others sound, bringing you an epic first release that is stomping and clean yet oh-so-dirty! This sonic Saffa team explore deeper and darker sounds here on their debut, boasting sharp atmospheres, weird FX, thick, chunky bass lines, and crunchy leads. This release aims to keep you digging deeper and grooving properly on the dance floor! Ranging from 148-150 BPM, each face-melting track tells its own story, thoroughly winding and unwinding each groove and taking you on a journey down twisted territory and into the minds of these two talented producers. Play it loud, folks! All tracks written and produced by Corbin Todd-Duff and Byron Sampson. Mastered by EVP @ Wild Mastering. Cover Art by Eduan Groenewald. Released in 2016 by Psynon Records. For bookings please email: [email protected]. Psynon Records can also be found on Bandcamp, Facebook, and SoundCloud. HigherWattska Euro .Uk.South America Tour 2016 … Open for Bookings . shoutout to highstyle and killawatt, love your sounds together! thanks for the quality release. these guys alone are impressive but now the two of them are dynamite!!!!! South African psy for the win! Very good, speedy and trippy. Visions of me of running fast from cacti in desert. Cool chirping sound repeats on this album like on Digital Forest album. lots of crinkly wrappers here 4.5/5. Needs accoustic breakdown otherwise straight up down good or uh excellent to say the least most. This badass has been my in favourites for some time now. And still is.